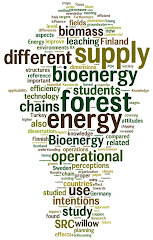 Bioenergy Corridor: Can we measure the effects of energy policies? Can we measure the effects of energy policies? To measure the effects that specific policies have on the promotion of new technologies is quite difficult. In Sweden, during the 1980s and 1990s there were many changes in the policy framework affecting the promotion of willow cultivation for bioenergy. We have tried to measure these effects by assuming a S-shaped model to explain the adoption rates of willow by the Swedish farmers. The paper is "The effects of policy incentives in the adoption of willow short rotation coppice for bioenergy in Sweden", and has been published in Energy Policy. The effect of policy incentives in the development of short rotation willow plantations for bioenergy is studied by using an aggregate adoption model based on sigmoidal curves for the Swedish municipalities. A total of 56 municipalities were studied, with 891 farmers that planted willow during the period 1986–1996. The model included variables related to the subsidies applied, the taxation on fossil fuels, the development of the wood-fuel consumption by the district heating systems, and the geographical and socio-economic characteristics of the municipality. Results of the simulations using the model show an increment of almost 70% of farmers planting willow during the period studied when the subsidy and tax incentives and the increments of the wood-fuel capacity by the district heating system took place. This study gives tools for future policy implementations in order to achieve the goals of the energy strategies.